Isn’t that the essence of discipline? Choose to do the hard things — even when you don’t feel like it — and eventually you’ll develop habits so that those things are no longer a struggle. I think about it when I’m tempted to skip evening devotions with the girls, when I’d rather put the clean laundry in a basket to fold later, when I’d rather do anything than cook dinner or when the book I’m reading is calling my name while my to-do list is still a mile long. And you know what? It’s not just some trite saying; it’s true. Since I made a personal commitment earlier this summer to develop better discipline and began attacking one area at a time through our Family Boot Camp, I’ve seen progress. Not perfect progress, of course, and if I’m sure of one thing it’s that I never will be perfect. 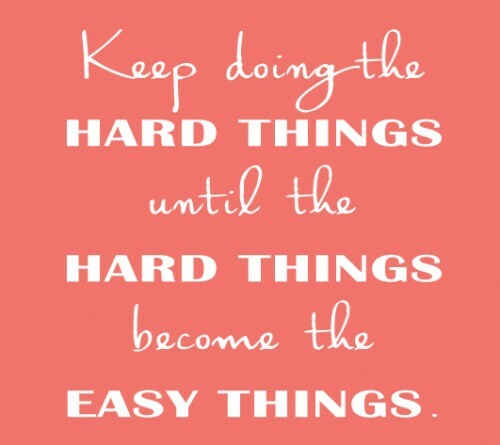 But each time I choose to do the hard thing, it gets just a little bit easier! What hard things do you need to practice doing? Previous PostUpcoming Webinar: Is Time Out a Waste of Time?